Budapest, December 2010. Following the repeated invitations by the Delegate of the Sacred Military Costantinian Order of Saint George in Budapest, the Hon. Zsolt Semjén, Vice-President to the Council of Ministers, Their Royal Highnesses the Princes of Bourbon – Two Sicilies, Duke and Duchess of Castro, travelled to Hungary from December 1 till December 3, 2010 on an official visit. The Royal Highnesses were accompanied by His Most Reverend Eminence The Cardinal Renato Raffaele Martino, Grand Prior of the Costantinian Order, His Excellency the Ambassador Giuseppe Balboni Acqua, General Secretary of the mentioned Order, by the Illustrious Professor Leonardo Saviano, General Secretary to the Royal House of Bourbon-Two Sicilies and by other Associates of the Great Chancery of the Order. Upon arrival at the airport the illustrious Guests were welcomed by the State Under Secretary to the Ministry of Justice and of the public Administration Doctor Bence, by Doctor Frivaldszky Attache to the Cabinet of the Honorable Council Vice President, by Madame Councilor Mirta Gentile from the Italian Embassy in Budapest and by Officers of the Hungarian Diplomatic Protocol and of the City Airport. A bouquet of flowers was presented to Princess Camilla as a gesture of welcome to the visit by the Royal Couple before the formation of the motorcade which led the Costantinian Delegation to the Ungarian Parliament , awaited by the Hon. Doctor Zsolt Semjén, Vice President to the Council of Ministers, assisted by his chief associates. After a brief conversation in a room of the Parliament, the Hon. Semjèn offered a luncheon in honour of the Duke and Duchess of Castro, who were later escorted to the Main Parliament Hall where a debate was in full course. The rotation President briefly suspended the session to express a welcome to the Princes of Bourbon-Two Sicilies, after which they were applauded by all Parliament Members present. H.R.H. Prince Charles thanked for the appreciated homage and subsequently left the Chambers to reach the residence of His Most Reverend Eminence Cardinal Péter Erdö, Archbishop of Ezstergom, Budapest and Primate of Hugnary, who entertained the Illustrious Guests in cordial conversation. T.R.H. later reached the Italian Cultural Institute, located in the magnificent building which hosted the original venue of the Hungarian Parliament , where they met with the Wife of the President of the Republic, who on behalf of her absent husband travelling abroad, lent particular emphasis to the Duke and Duchess’ stay in Budapest, as well as to the lecture on the Costantinian Order held by the Illustrious Professor Leonardo Saviano, teacher of History of Political Doctrines at the Federico II° University in Naples. At the end of the speech Princess Camilla donated a gift to the Institute of Sick Children, managed by the Franciscan Fathers of Budapest, a personal monetary contribution, as a testimonial of solidarity and charitable spirit. The Ambassador of Italy Giovan Battista Campagnola and his Consort Zohara offered a banquet (dinner) in honour of T.R.H. at their own residence, where the Princes of Bourbon-Two Sicilies were guests during their sojourn in Hungary, together with Lord Cardinal Martino and the Ambassador Balboni Acqua. The following day, on Thursday 2 December, the Costantinian Delegation, accompanied by the Council Vice President Hon. Semjén went on a tour of the city and of the Archdiocese of Ezstergom, where they were received by His Eminence the Cardinal Làslo Paskai, the Archbishop Emeritus, assisted by the Most Reverend Monsignor Endre Gaàl. Provost of the Metropolitan Chapter of their ecclesiastical precinct. After the audience in the Archbishopric hall it was proceeded with the investiture ceremony of the new Costantinian Knights in the Chapel of the Archiepiscopal Palace, and subsequently His Most Reverend Eminence the Cardinal offered a luncheon to all the guests. The visit drew to a close in the afternoon with the homage paid to the tomb of Cardinal Mindszenty in the city’s Cathedral. That evening, in the beautiful hall of the Gobelins of the Hungarian Parliament, where the shrine containing the Crown of Saint Stephan, first King of Hungary, is kept, which was donated to His Holy Pontiff Sylvester II in the year 1000 , the Parliament Vice President. Hon. Jànos Larcai, offered a luncheon to all distinguished guests to which the Ambassador of Italy H.E. Campagnola, accompanied by his wife and other Italian personalities, also took part. In the Greeting Toast H.E. President Latorcai thanked Their Royal Highnesses for their trip to Hungary with the expressed wish that they may have felt “at home”, whilst remembering the significant period in the distant Middle Ages connected with the Royal Family of Bourbon, in which Hungary asserted itself as a solid, important and influential State of Christian Europe. The next day, Friday 3 December, within Sandor Palace, which hosts the Presidency of the Republic, is when the meeting with the Head of State, Hon. 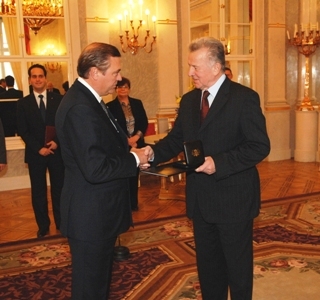 Prof. Pal Schmitt took place, who had expressly anticipated his return from Astana where the summit of the Leaders of the OSCE Countries took place, just for the purpose of convening with the Duke and Duchess of Castro and Cardinal Martino, whom he wanted to decorate respectively with the Gold and Silver medal of Merit of the Republic of Hungary. The ceremony marked by the rigid protocol order, and the informal and most pleasant meeting which followed, concluded the Costantinian Delegation’s visit to Hungary, which was as most satisfactory to both parties for their achievements and the prospects for further future contacts for the joint implementation of charitable projects and social development.